Today, following weeks of intense negotiations, BrooklynSpeaks sponsor organizations and local residents announced they have reached a landmark settlement with Forest City Ratner Corporation (FCRC), the developer of the Atlantic Yards Project in Brooklyn, and the Empire State Development Corporation (ESDC), with the support of the City of New York. The accord, which includes a signed agreement with ESDC and another with FCRC, ensures at least 590 units of promised affordable housing are started within the next 12 months and delivers 2,250 promised affordable housing units ten years earlier than previously agreed. It also establishes an Atlantic Yards Tenant Protection Fund and penalties for failure to meet affordable housing milestones. The settlement will also result in the creation of the Atlantic Yards Community Development Corporation, a subsidiary of the ESDC charged with overseeing compliance with all project commitments. Under the terms of the agreement, construction on the first of the affordable units will begin by the end of the year, and all affordable apartments must be completed by May 2025. Creation of an ESDC subsidiary, including locally-appointed directors, to monitor compliance with all project commitments. In addition, through a complementary commitment by FCRC, the developer will make a contribution of $250,000 to establish the Atlantic Yards Tenant Protection Fund to provide eviction prevention services to members of the community vulnerable to displacement. The agreement was signed between New York State, Fifth Avenue Committee, Pratt Area Community Council, Brown Community Development Corporation, Boerum Hill Association, Diaspora Community Services, Park Slope Civic Council, Prospect Heights Neighborhood Development Council, Benita Clark, Hermelinda Gumbs, Daron Hudson and Renee Mintz, and commits Forest City Ratner, through relevant project documents, to accelerated timelines and performance guarantees for the affordable housing and for ESDC to create the subsidiary within six months. “The delay of the promised 2,250 units of affordable housing has had a significant impact on residents in the communities surrounding the project and that impact was only going to worsen – especially for African Americans – with further delay. We’re pleased that our tireless efforts to ensure public accountability have paid off, and that we were able to come to an agreement with Forest City and the State to ensure the community finally gets the affordable housing it was promised 10 years ago. This agreement represents a big step forward for both timeliness of the affordable housing and, equally importantly, accountability,” said Michelle de la Uz, Executive Director of the Fifth Avenue Committee. BrooklynSpeaks organizations and local residents were preparing to file a legal challenge under the Federal Fair Housing Act, charging that 2009 agreements between FCRC and ESDC which delayed promised housing until 2035 would result in fewer African Americans in Brooklyn community districts 2, 3, 6 and 8 having access to Atlantic Yards’ affordable apartments. A study commissioned by the Fifth Avenue Committee, one of the BrooklynSpeaks sponsors, shows that in 2000, African Americans comprised 52% of the population of the combined area of community districts 2, 3, 6 and 8, which surround Atlantic Yards, but represented only 40% in 2010. The study further projected that African Americans will represent only 15% of the districts’ population by 2035. “Each year affordable housing at Atlantic Yards is delayed harms African American residents in community boards 2, 3, 6 and 8, who would be eligible for preference in the lotteries through which the apartments will be awarded,” said S. Calvin Walden, a partner in the law firm WilmerHale, one of the pro bono lawyers who worked with the groups and local residents on the settlement. “Without the affordable housing that was promised, those of us who live in the communities around Atlantic Yards; the people who made our communities more livable, can’t afford to stay here,” said long-time Prospect Heights and Bedford Stuyvesant resident and congregant of Brown Memorial Baptist Church, Daron Hudson. “Gentrification and displacement are very real. As an attorney of color, I’m so happy to have been a part of an agreement that helps African-Americans and others maintain the fabric of their communities,” added Aurelia Hepburn-Briscoe, an attorney with WilmerHale who was part of the community groups’ legal team. 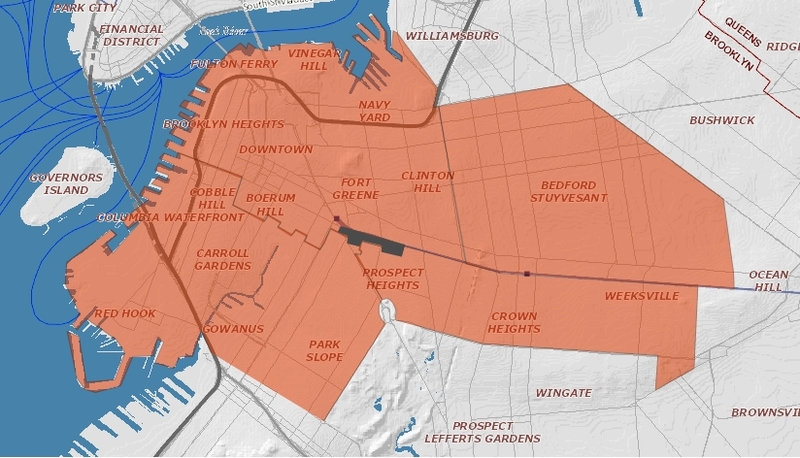 Under the terms of the settlement, project milestones for the second and third residential buildings at Atlantic Yards (B14 and B3, respectively) will be accelerated, and the number of affordable apartments to be contained in them increased, such that at least 590 affordable apartments will begin construction by June 30, 2015. Together with the 180 affordable apartments currently being constructed in B2, at least 770 affordable apartments are expected to be available by October 2016. By comparison, the 2009 project agreements required FCRC to deliver only 300 affordable apartments by 2022. Further, the settlement requires a subsidiary of ESDC, the Atlantic Yards Community Development Corporation (AYCDC), be created to oversee compliance with project commitments. AYCDC will be governed by a board composed of 14 directors, of which five will be appointed by local elected officials including the Mayor, the Brooklyn Borough President, the Speaker of the New York City Council, and the leadership of New York State Assembly and State Senate. The board will meet at least quarterly in meetings open to the public. "The Atlantic Yards project has been a definitive part of our City's development -- transforming Brooklyn's landscape and providing the opportunity to maximize on our complex urban environment. Today, the project moves in the right direction addressing the great need for affordable housing within a 10 year timeline. It also provides much needed oversight through a subsidiary that includes community involvement. I look forward to continuing along this path of progress and accountability, and ensuring that the needs of our community are prioritized and efficiently addressed." said Assembly Member Water Mosley. “We’ve heard time and again the story of a developer who promised a large development with great public benefits, then failed to provide said pieces of the project. It is crucial that local communities hold developers and officials accountable for their actions,” said Jo Anne Simon, a lawyer, Democratic Committeewoman and District Leader for the 52nd Assembly District and past president of the Boerum Hill Association. Significantly, the settlement requires all 2,250 affordable apartments at Atlantic Yards to be completed by 2025. Failure to provide all the apartments by then will cause the developer to be assessed a penalty of $2,000 per apartment not completed for each month of delay. “This agreement provides an enforceable mechanism to ensure that the affordable housing that was promised to win the project’s approval is built, and built soon. We are thrilled to support low-income residents of Brooklyn in their struggle to keep affordable housing in downtown Brooklyn,” said Ted De Barbieri, one of the attorneys who has been working with the community groups, and who is a Senior Staff Attorney at the Urban Justice Center’s Community Development Project. In order to ensure affordable apartments are constructed in parallel with market rate units, the agreement also requires that a minimum of 35% of all units for which construction has commenced will be affordable until the completion of the first 1,050 affordable apartments. Following the start of 1,050 affordable apartments, the developer must maintain a level of 25% affordable units having begun construction until all 2,250 affordable apartments are built. If the developer falls below this 35%/25% threshold, it will not be able to complete a single market rate unit until the threshold is again met. At project completion, affordable apartments must be 35% of the total units. All penalties for missed deadlines and other project benchmarks will be paid into the New York City Housing Trust Fund administered by New York City’s Department of Housing Preservation and Development (HPD), and will be used for the creation and preservation of affordable housing with preference given for projects in Brooklyn community districts 2, 3, 6 and 8. This arrangement is a first of its kind for an ESDC project. Finally, under the terms of a separate agreement with FCRC, the developer will contribute $250,000 towards a newly-created Atlantic Yards Tenant Protection Fund expected to be administered by the Brooklyn Community Foundation. The Fund will provide grants to local nonprofit organizations offering eviction prevention and anti-displacement services to low and moderate income residents of Brooklyn community districts 2, 3, 6 and 8. “Seems like it has been an eternity getting this project to the point where we have a written commitment to produce the affordable housing in the next ten years, and oversight with community voices represented, but the community, through BrooklynSpeaks, has ultimately prevailed. We’re quite pleased that the newly created Tenant Protection Fund will be a significant resource to help address pressures from gentrification and displacement affecting vulnerable members of our community. We are grateful to those at ESDC, FCRC, the Governor and the Mayor’s office who, together with us, crafted a workable agreement,” said Deb Howard, Executive Director of the Pratt Area Community Council. “For many, the struggle to get the affordable housing promised for the Atlantic Yards project has been going on for ten years. Since the announcement of Atlantic Yards, all of us have advocated for a fair process, community inclusion and benefits for hard-working Brooklynites,” said Reverend Clinton Miller, Pastor of Brown Memorial Baptist Church. “With this agreement, we’ve made a giant step forward and we’ve proven that communities need to be vigilant and use every strategy possible to get what’s just,” he added. "I am proud to be a part of this agreement that will accelerate the affordable units at Atlantic Yards. This shows that government, developers and the community can work together for the best interest of working families. I'm impressed with the work of the ESDC, the Mayor's office, FCRC, Fifth Avenue Committee, Brooklyn Speaks and our partner organizations in coming to this landmark agreement,” said Marjona Jones, organizing coordinator for Brown Community Development Corporation. "This settlement represents a significant advance for the whole community surrounding and affected by the Atlantic Yards project. The accelerated delivery of affordable housing will benefit thousands of Brooklynites at a critical time, and we believe this is a step in the right direction in its terms, with great potential to be executed as structured. Moreover, the community will gain a degree of project oversight for the first time. The Park Slope Civic Council strongly supports affordable housing in our neighborhood and throughout Brooklyn, and applauds this positive settlement and the consistent and dedicated hard work of the parties that brought it about,” said Gilly Youner and Judith Lief, Co-Presidents of the Park Slope Civic Council. "Our organization has maintained offices in Park Slope for over 15 years. The primary needs for the over 10,000 individuals we serve annually is access to quality healthcare and affordable housing. This collaborative approach by community partners and government is a perfect example of how the community's best interest can succeed. This agreement allows all people, including working class people and communities of color, to know they are valued and can afford an appropriate place to live,” said Carine Jocelyn, Director of Diaspora Community Services. Documents relating to the settlement are available here.